Your trip to Bacolod City won't be complete without having a piece of cake at Calea, they say. I guess that's true. Because really, how can you miss the famous cake heaven in Bacolod City? I literally mean heaven because you'll be greeted with more than 20 different cakes to choose from! How crazy is that? 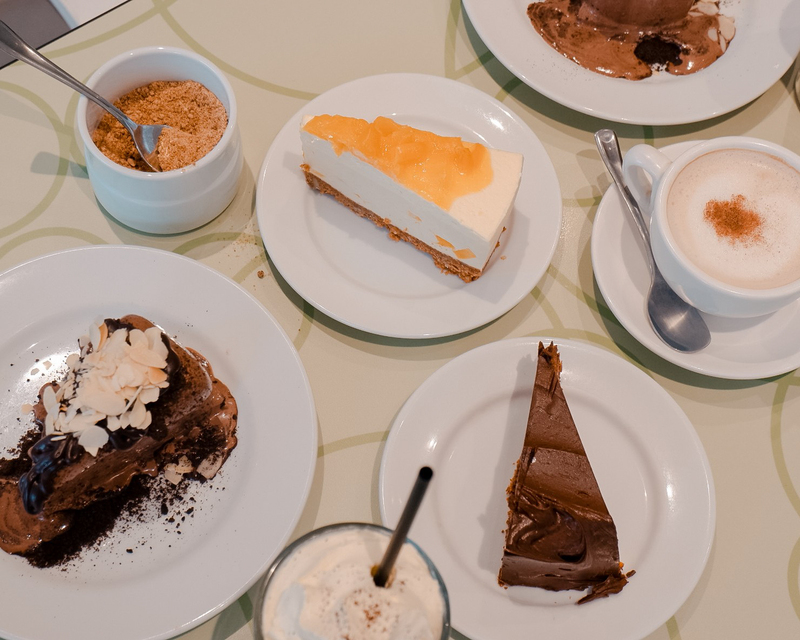 Calea Pastries & Coffee is definitely a place you shouldn't miss when you're in Bacolod, most especially when you're looking for something to liven up your day. We booked a Grab car going to Lacson Street where Calea was located. The driver was very kind to share some tips on what we should try in Calea. He suggested we try the Chocolate Mud Pie because it's one of the most famous and the best-seller in Calea. We took note of that, of course. He also said that that time was a good time to visit Calea because the place gets jam-packed during the evening. When we arrived, we saw that the place was actually already packed but the driver said that it was still a few compared to what he mentioned earlier. So anyway, we got off the car and then we saw this beautiful door at Calea. It was definitely the prettiest cafe door I have seen so far. And I love that you'll be greeted with a very encouraging statement, "Eat more cake." Yeah, thanks. What diet, right? Haha. We went inside, looked for vacant seats, and ordered a few cakes and drinks. Just look at that selection of cakes. They have I think four display cases and they were all filled with cakes of different flavors, designs, and sizes. I got the Mocha Frost, Sheen got the Cappuccino Frost, and Zayn got the Chocholate Milkshake. My drink was good but Sheen's and Zayn's were not. I tried the Cappuccino Frost and it was kind of bland it needed more pumps of coffee. Zayn didn't finish his milkshake, actually he didn't even drink at least half of it, because the chocolate powder or whatever they used was quite off. Zayn is very attentive to the flavors of whatever he eats and drinks, so when he says he doesn't like it, it's definitely not delicious. For the cakes, we followed what the driver told us. We ordered Chocolate Mud Pies and indeed it was soooo good! Sheen and Zayn adore ice cream more than cakes and since the Chocolate Mud Pie is an ice cream cake, it was a two thumbs up for them. In fact, it's a two thumbs up for me too. So when you visit Calea Pastries & Coffee, you should really order this! The French Chocolate Cheesecake was actually really good too. It gives you the melts-in-my-mouth experience because the chocolate is very rich and creamy. It also had hints of salted caramel which complemented the rich chocolate very well. The Mango Cheesecake, on the other hand, was a thumbs down for us. Sheen and I are huge fans of cheesecakes and this one was quite a disappointment. The cheesecake's main layer is supposed to be soft, smooth, and super rich. But that wasn't the case for Calea's Mango Cheesecake. It was, instead, very gelatinous. And it was bland too. I'm not sure if they wanted to make their own take of a cheesecake but surely, it was not that appealing to us. Nevertheless, it was still a very sweet and delightful afternoon at Calea Pastries & Coffee. I want to go back and try other cakes but that's to be discussed in the future. How I wish they'll open a branch here in Cebu too. Ahhhh I want the chocolate cake nowwww :D Sarap! Those pecan pies just look so delicious (actually everything does), I seriously want to visit NOW! Wow! This one's a winner.I just love everything about this!My boys would both probably DIG this! The French Chocolate Cheesecake is calling my name!! I'd love to have that for a weekend dessert (oh wait, it's the weekend! ;) ). My mouth is watering at all those chocolate cakes! Felt the same thing when we went there too! Sweet cake is one of my favorite dishes. Your photos make me want to go there right now. Thanks! Hope you can visit the Philippines one day! Dessert is my favorite meal of the day, so this is somewhere I would definitely need to try. I appreciate when locals can give some insight on what to order. With so many options, I wouldn't know where to begin! I agree. It would be best to hear it from the locals because we're sure that it has been proven and tested! haha. And I know right! There were so many options it took me a while to choose! How did you ever decided what to get? Everything looks way to tempting for me. All of these sweet treats look so delicious. While I'm typing this I'm eating a yummy mint cheesecake. Desserts are great to enjoy once in a while. I couldn't agree more with you on that! And mint cheesecake sounds superb! I haven't tried that kind of flavor yet! Oh these cakes are making my mouth water! Fantastic choices here, your pictures are just lovely. Wow! I would love to visit this shop. Those cakes, frappes, and pies looks really delightful and tempting. I feel so hungry right now.